Thanks to the increase in number of gamers signing up for flower delivery offers for Moms, Mother’s Day was payday for social game publishers this year, with ad-funded payments skyrocketing during the holiday. TrialPay, a startup that powers an offers-based payments platform on Facebook, has released a number of data points that show the strength of the Mother’s Day market this year. Mothers Day represents a huge gift giving market, second only to the holiday season. Last year lone, $14.1 billion was spent on Mother’s Day-related gifts. In the week leading up to Mother’s Day, about $1 million per day was generated by “gifts for mom” promotions that paired offers from online flower merchants like 1-800-Flowers with free in-game virtual goods and currency. According to TrialPay, social game publishers running Mother’s Day campaigns saw five-fold increase in offer-based revenue, which generally accounts for 15-20% of a social game’s total revenue. Visitor conversion rates more than doubled during Mother’s Day (player-to-payer conversions). And 40% of consumers were first-time buyers that had never made a purchase through a game. 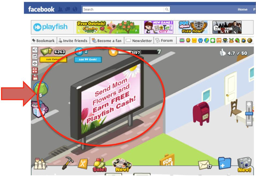 TrialPay Facebook-focused offers platform is used by a number of big-name social game publishers including Playfish and Playdom. In fact, Facebook recently announced its foray in the offers game, and partnered with TrialPay to use their offers in the test round. Clearly, there’s a lot of money in the offers space and Facebook wants a piece of the pie.